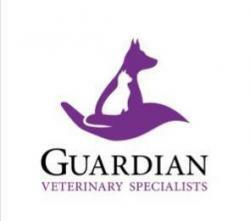 Guardian Veterinary Specialists is a full functioning veterinary emergency and critical care specialty hospital. Our doors are open 24 hours a day, 365 days a year—even on major holidays—to provide life-saving care for pets in a health crisis. Highly skilled emergency veterinarians, licensed veterinary technicians and expertly trained support staff monitor patients around the clock, whether your pet is here for an out-patient visit or overnight stay. We care for our patients first. That means we place the healthcare needs and well being of our pet patients above all other concerns. Pets with complex, critical or chronic diseases may be referred to our advanced specialty services. Our specialized services include Internal Medicine, Surgery, Neurology and Neurosurgery, Oncology, Cardiology, Ophthalmology, Behavior Services and Rehabilitation. Our board-certified doctors have completed many years of advanced academic and clinical training to earn their veterinary specialist credentials. We offer the most sophisticated diagnostic testing, imaging technologies, and medical and surgical treatments.